S1: Roll Dice - Rolls 2 dice to attack the enemy target 2 times and grants an effect according to each number you get for 2 turns as follows; 4: Unrecoverable, 5: Decrease DEF, 6: Increased chances of missing. Instantly gains another turn if you get the same number. S2: Dice Trick - Rolls 2 dice to attack all enemies and randomly grants Unrecoverable, Decrease DEF, Increased chances of missing Effects for 2 turns. More effects will be granted as the sum of the numbers increases. Instantly gains another turn if you get the same number. Unlucky 7 - Rolls 2 dice to attack all enemies and Stuns them for 1 turn if the sum of the numbers is greater than 7, and decreases the Attack Speed for 2 turns if the sum is less than 7. Instantly gains another turn if you get the same number. S3: Dice Madness - Rolls the dice 4 times to attack all enemies. The larger the number of dice, the greater the damage. If the number is the same as the previous number, the attack ignores the enemy's Defense. Returned Dice - Makes the Attack Bar of all enemies and all allies change to 0, and increases the Attack Speed of all allies for 2 turns. This effect can't be resisted and ignores the immunity. Destiny Dice - Rolls 2 dice to decide the HP state of the enemy excluding the Boss or the ally target according to the number on the dice. Instantly gains another turn if you get the same number. This effect can't be resisted and ignores the immunity. S1: Tempting Dream - Attacks the enemy target to absorb the Attack Bar by 15% with a 30% chance and puts the enemy to sleep for 1 turn with a 10% chance. The damage increases accordingly to your Attack Speed. S2: Nightmare Melody - Puts all enemies to sleep for 1 turn and inflicts Continuous Damage for 2 turns with a 50% chance, each. Healing Music - Recovers the HP of all allies by 20% each, and grants immunity for 1 turn. S3: Distorted Healing Magic - Attacks all enemies to put them to sleep for 1 turn and creates a shield that's equivalent to 30% of the damage on all allies for 3 turns. The damage of this skill increases accordingly to your MAX HP. Unwanted Harmony - Evens the HP of the enemy target, excluding the Boss, and the ally with the lowest HP. Decreases the HP of the enemy target by 15% and recovers the HP of the ally target by 15%. This effect can't be resisted and ignores the immunity. Song of Switched Destiny - Switches the current Attack Bar and HP with the enemy, excluding the Boss, or another ally target. This effect can't be resisted and ignores the immunity. Au risque de me répéter ... EUUUUH WUUUT ?! En fait, ces nouveaux monstres sont un peu "spéciaux", un pour comme Léo. - Léo, lui, il met la vitesse de tout le monde au même niveau. - Le Harpe met tout le monde au même niveau de PV, avec un boost du coté de sa team. - Le Dé met tout le monde au même niveau d'ATB, avec un boost du coté de sa team. C'est pas trop déconnant en fait. C'est surtout le Harpe qui peut être dangereux pour tout le monde. Bien qu'après ce skill, il y ai 30% de différence entre nos PV et ceux de l'ennemie, il vaudrait mieux s'assurer qu'il n'y ai pas un AoE en face sur le point de jouer lol. Le Dé... il peut aider à recommencer son enchaînement de début de match. 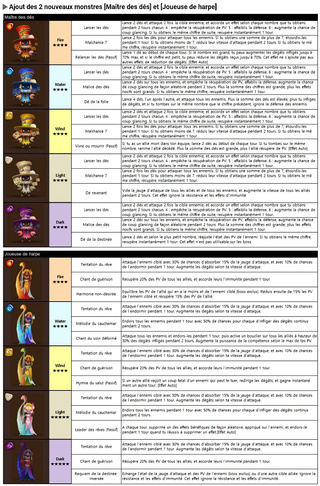 Ce qui voudrait dire que c'est le Dé Light qui aura le skill sur la vitesse, et le Harpiste Eau qui aura le skill sur les PVs ("Harp Magician", c'est Magicien à la Harpe, pas Harpie ^^). 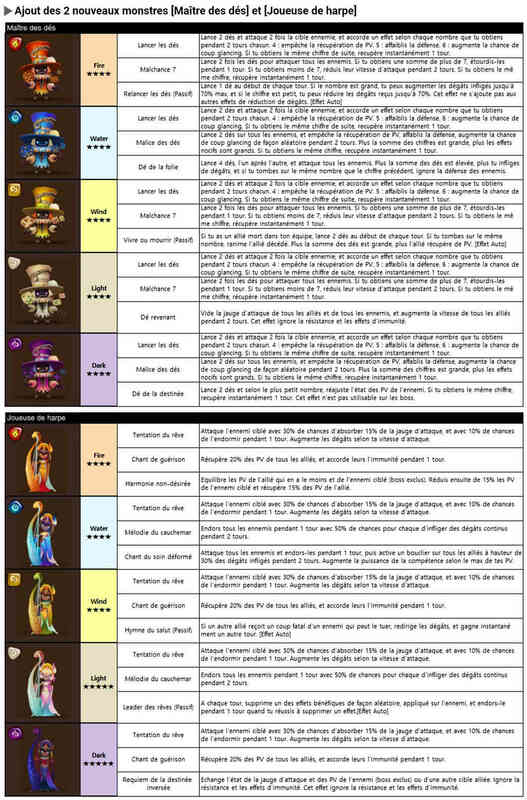 Bref ils ont l'air fun et c'est sûr que l'un des deux sera peu courant en 5* nat, l'autre entre 3 et 4*. Peut-être. Elle est grande, donc cliquez dessus. Le Lanceur de Dé feu me rappelle un perso de Wakfu : L'Ecaflip (dans sa première version car maintenant il a perdu tout intéret). On ne sait jamais, il faut être joueur ! Le wind aussi est intéressant... mais c'est un rez "pas à coup sûr" donc bof. Le light reset les ATB... pas mal pour un double-combo de nuker au début des tours (si les cooldowns sont là). La feu est assez drole, équilibrer les PV entre l'un de nos perso et un ennemie... c'est sale lol. La eau... 2 sleep-AoE... ça peut faire très mal ! La dark Débuf auto d'un ennemie en passif... qu'on endort si on réussit... il lui faudra 100% de précision ! La light... son skill 3 permet d'échange ATB+PV avec n'importe quelle autre monstre, allié ou ennemie... GG ! Une petite vidéo en plus !